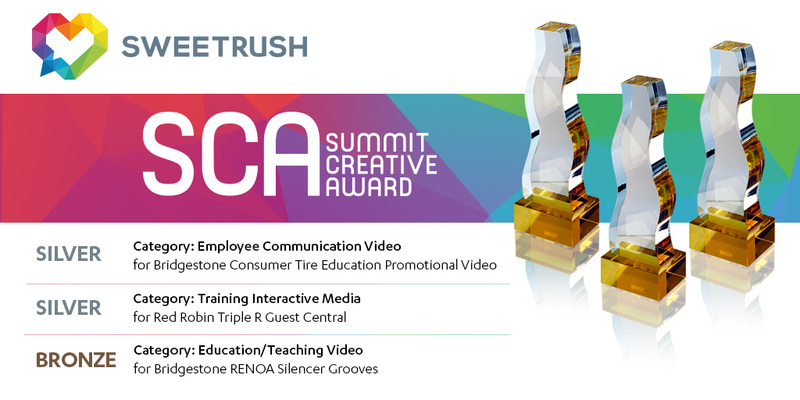 San Francisco, Calif., June, 13, 2016 – The Summit International Awards recently announced the winners of the Summit Creative Awards (SCA) and SweetRush, Inc., stood out in three categories for collaborations with our client partners Bridgestone Americas, Inc., and Red Robin International, Inc. The SIA organization was founded in 1994. Annually it conducts the Summit Creative Award, the Summit Marketing Effectiveness Award and the Summit Emerging Media Award. The Summit Creative Award recognizes and celebrates the creative achievements of small- and medium-sized advertising agencies worldwide with annual billings under $30 million. Celebrating its 22nd year, the SCA has firmly established itself as the premier arbiter of creative excellence for firms of this size and has become a coveted honor. Additional information about the Summit International Awards organization, its competitions and winning firms can be found on the SIA web site at www.summitawards.com.